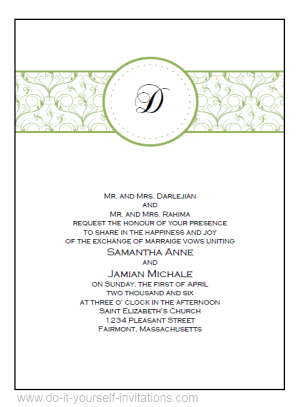 Use this free printable wedding invitations templates to print and make your own invitations that are both simple and elegant. 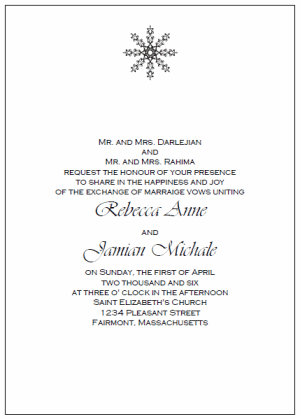 The invitations are available for instant download, and are presented in the form of an interactive PDF file. You can enter your own monogram letters and text. 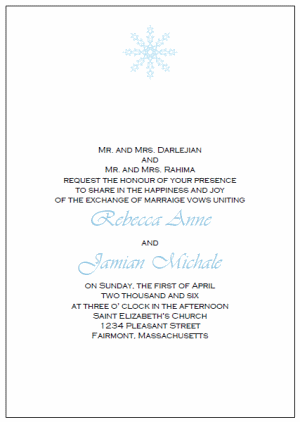 You can even change the fonts, text size, and color of the font. 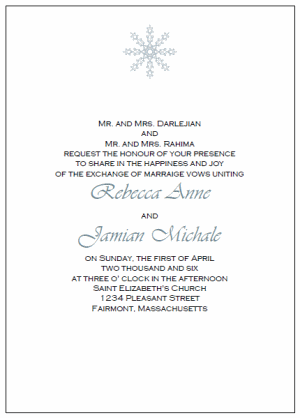 The invitations are set up to print two to a page on a single sheet of standrad 8 1/2" by 11" paper. 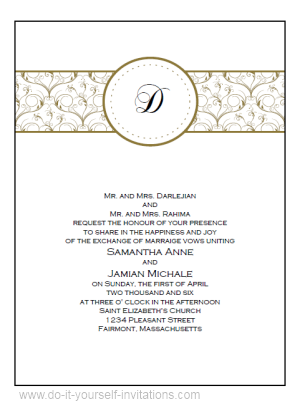 There are handy cutting guidelines included to trim the invitations down to a standard 5 by 7 invitation. 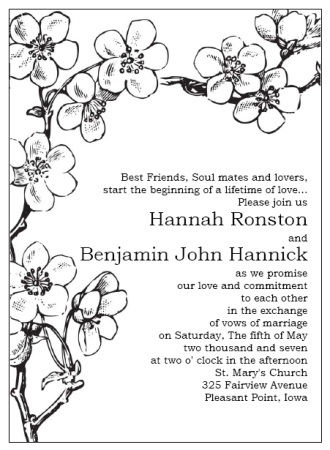 These free printable wedding invitations can be printed onto some nice heavy cardstock, trimmed to size, and used simply as is. 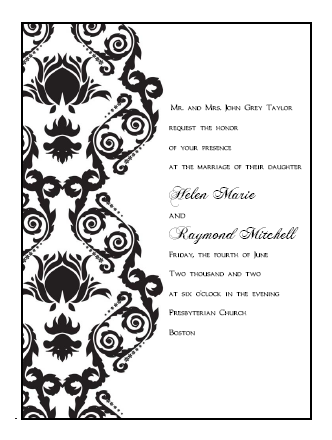 You can bring it a little further for an ultra elegant invitation, by mounting the invitation onto colored cardstock, or even inside of a blank pocketfold invitation. Add ribbon, charms, or even rhinestones! 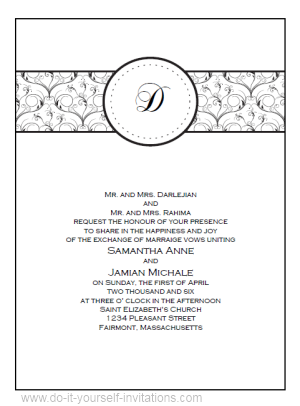 To use the templates simply download the PDF file and save it to your computer. Open the PDF and select the cursor tool. Highlight the text you wish to edit and hold down the "Control" and The "E" buttons on your keyboard at the same time. This will present a tool palette in which to use for changing the fonts, sizes, alignment, and even the color of the text. 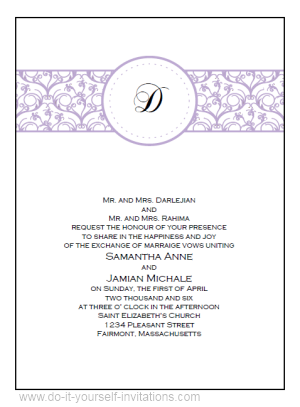 When you are done making changes save the file and print it! 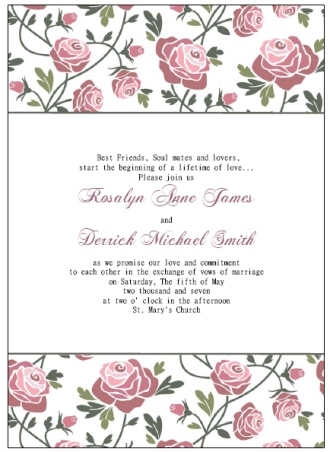 To see some more freebie printable wedding invitations and other printables and templates, be sure to visit the Do It Yourself Invitations Printable Invitations Page! To download and read any of the above PDF files you will need to install the free adobe reader. 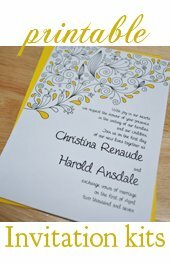 Need some nice fonts to use with your templates? Check out 1001 free fonts or Dafont for a vast library of assorted fonts to download for free.